What Is Structured Word Inquiry? Structured Word Inquiry (SWI) is a scientific investigation of words: how word parts, structure, origin, and history over time come together to tell the story of what words mean, how words are connected, and how they are spelled. (Please refer to foundational research at Bowers & Kirby, 2010.) It is a linguistically sound approach to language instruction that Nueva has integrated into its PreK–12 literary arts, English, and thematic curriculum with the help of Dr. Peter Bowers. Dr. Bowers is the founder of the WordWorks Literacy Centre and has supported this transformation as a consultant over seven years. He was a visiting scholar and SWI coach at Nueva during the 2015-2016 school year. SWI is about understanding larger patterns across words, i.e., shared roots/bases/families, as much as understanding the evolution and structure of one word. Students learn investigative tools to understand new vocabulary, and so they can apply SWI across every discipline. When students use roots or a word's structure to understand new vocabulary in a content area such as math or history, they are applying their SWI understanding, exposure, and skillset. 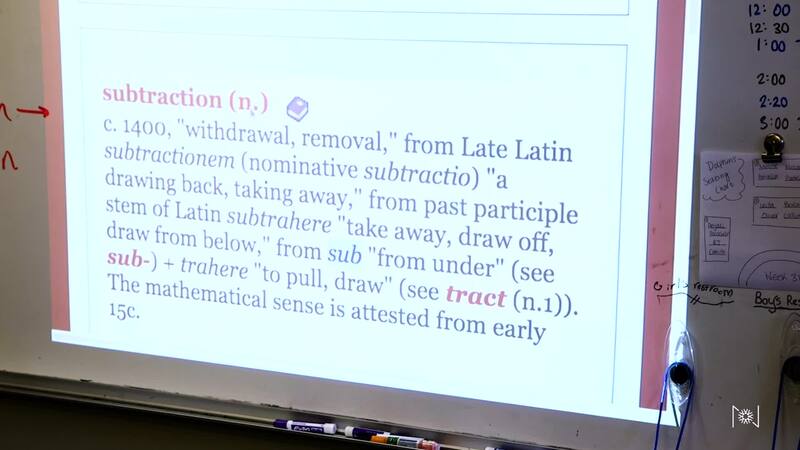 Using linguistic tools like word sums and lexical word matrices, students analyze words into elements such as bases, prefixes, and suffixes. By understanding the spelling of other words in that family, students can create meaningful connections across the language to build proficiency in orthographic analysis. The word sum is a necessary tool to allow falsification of hypotheses of orthographic morphological structure. Source here. The lexical matrix specifies the association between word meaning and word form. Each column of the lexical matrix corresponds to a particular word meaning (or concept), each row corresponds to a particular word form (or word image). In its simplest form, SWI is an inquiry process. Students begin by asking, “What does the word mean?” They brainstorm ways to define and interpret a given word. Next, students look at the composition of the word. "How is the word built? What is its structure?" This includes identifying its root, prefix and/or suffix which begins to provide important clues. Students explore the word's history and etymology. They ask, “What is the word’s origin?” to find evidence for the word’s structural elements. They look beyond the word to make connections by considering related words, pronunciation, etc. "What do words that share the same structure or historical root explain about the word in question? How does pronunciation affect the spelling?" Finally, students pull their data together. “What deeper understanding do I now have of the word or word family, and the context in which I found it?" Why Does Nueva Teach SWI? SWI applies the Nueva philosophy to the study of the English language. It teaches deep, comprehensive understanding of our language and how to investigate it. Investigating words based on structure and meaning provokes a deeper questioning and provides a more holistic understanding of other curricular elements, whether a piece of literature, a scientific principle, a historical event, or a mathematical concept. Once students realize words are spelled the way they are for specific reasons, floodgates of curiosity open. Through their investigations, students discover patterns, structures, and applications as they learn to play with words in a creative environment. Through SWI, language becomes another medium to be questioned, tested, and, most importantly, enjoyed. The process is naturally scaffolded for a range of individual abilities and exposes students to rich vocabulary. Its effectiveness, particularly with the youngest learners, is grounded in research. In addition, the real-world classroom experience provides further feedback in the study and advancement of SWI. You can see an illustration of the role SWI at Nueva has had in the wider research on literacy instruction in WordWorks Newsletter #95 which highlights the description of a classroom experience by Nueva’s prekindergarten teachers.